1. 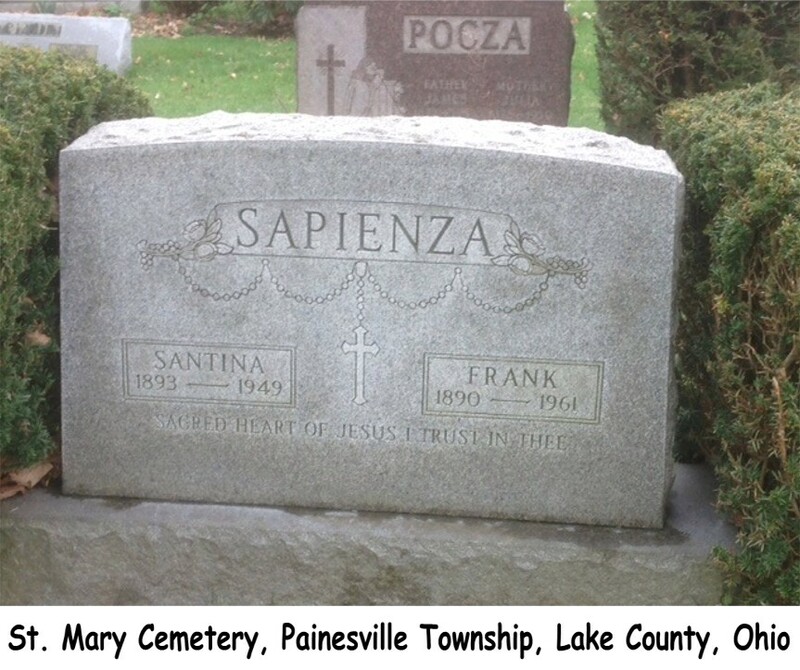 Infant of Frank Sapienza was born on October 2, 1917, at Painesville, Lake County, Ohio. The child died the next day. The male child lived for eight hours. His body was interred at St. Mary Cemetery at Painesville Township, Lake County, Ohio. 2. Josephine Sapienza was born about 1918, at Ohio. 3. Rosalia Sapienza was born on March 6, 1921, at Painesville, Lake County, Ohio. Rosalia died on March 16, 1921, at Owego Street, Painesville, Lake County, Ohio, of cholera infantium. Her body was interred at St. Mary Cemetery at Painesville Township, Lake County, Ohio.